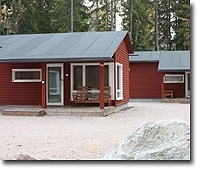 Family cabin has one bedroom with two beds and livingroom with two beds. The cabin has also shower/toilet, kitchenette (no oven) and terrace. fridge, microwave owen, dishwasher, tableware, coffee maker and TV. Linen and towels are included in price. One cabin is suitable for disabled.